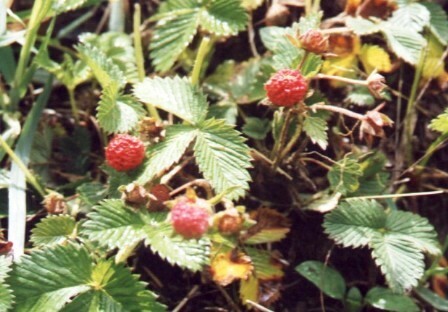 The small plants of bhuin aakhe, bearing bright-red fruits are commonly found at cool and shady locations in wastelands as well as in the cultivated fields. 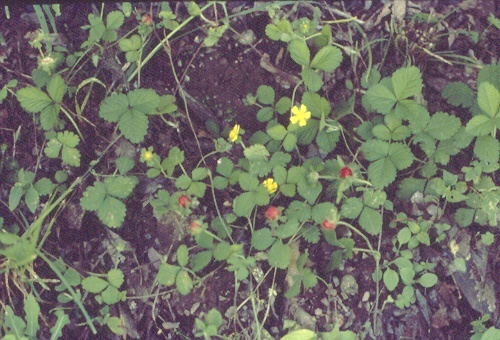 The plant resembles the strawberry to a great extent. The plant is found in temperate and subtropical Himalayas from the Indus to Assam up to 8,000 feet, the Khasia Hills and the Nilgiris. A perennial herb, having prostrate stems, with silky hairs on the stem; runners, growing all around and forming roots wherever the tip touches the ground; internodal length, 7.8 cm. 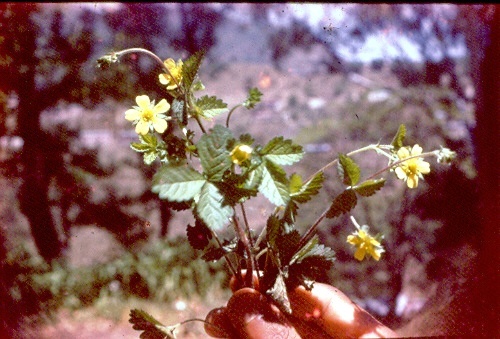 Leaves, stipulate (adnate at the base), trifoliate, pinnate terminal leaflets, 2.8 cm long and 1.6 cm broad; lateral leaflets, 2.4 cm long, 1.6 cm broad; general radical leaves having serrate margins. Flowers, solitary terminal and solitary axillary, pedicellate, yellow, ebracteate, 3-5 lobed at the outer end, 7 mm long, green, cyclic, hermaphrodite, pentamerous, superior and actinomorphic; the diameter of a fully open flower, 2 to 2.5 cm; epicalyx with 5 sepals; calyx gamosepalous, with 5 sepals, persistent, acuminate, alternate, green, actinomorphic, regular, inferior; corolla, with five petals, Dresden yellow 64, actinomorphic, inferior, clawed, 7 to 9 mm long, having valvate aestivation; androecium, polyandrous, with numerous about 20 stamens, actinomorphic, episepalous, inferior; gynoecium, with numerous pistils, apocarpus, very small, borne on a convex receptacle; stigma, very small. Fruit, an etaerio of achenes which are embedded in the surface of the fleshy receptacle almost globose, 8 to 12.1 mm in diameter; weight, 302 mg volume 509 microlitres; fruit colour Spirea red 025/1 pulp colour, Spirea red 025/3. The flowering, season starts from the third week of March and continues up to the end of June. Fruiting starts from the beginning of April and continues up to the end of August. The peak fruiting season in the Solan area was, however, observed to be from the first to last week of May. A plant of bhuin aakhe, spread over an area of 2.5 m2 yields 150 g of fruit annually. The fruits contain 58.7 per cent extractable juice and 77.4 per cent moisture. They also contain 6.,2 g of total soluble solids, 0.67 g acidity, 3.40 g of total sugars, 1.78 g of reducing sugars and 1.54 g of non-reducing sugars per 100 ml of the juice. Almost a negligible quantity of tannins was found in this fruit. The vitamin C content of the fruit is 6.29 mg per 100 ml of the juice. The total content of minerals of the fruit, as represented by its ash, is 1.647 per cent. The protein content of the fruit is 1.51 per cent. Other mineral elements, viz. phosphorus, potassium, calcium, magnesium and iron, are 0.077, 0.282, 0.126 0.121 and 0.010 per cent respectively. The fruits contain a very low amount of sugars and other soluble solids. They, therefore, taste practically flat. The overall fruit quality is poor. The small fruits are eaten by children. They are, however, not very popular, as they lack sweetness and have a flat taste.